Where is the Mummy of Ancient Egyptian Queen Amenirdis I – Kushite Princess of Nubia – XXV Dynasty? The belongings and funerary goods of Amenirdis I are spread around the globe both in museums and, sadly, in private collections away from public view. 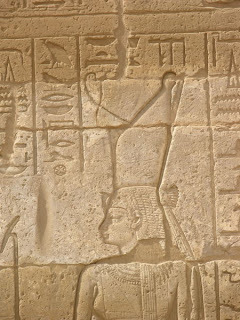 She was a very important woman in ancient Egypt – as were all God’s Wives of Amun and Divine Votaresses – and possessed a considerable amount of ‘personal’ and mortuary goods. In antiquity many items will have disappeared in to the mists of time and as recently as the twentieth Century, Amenirdis’ possessions found their way in to museums, private collections and the like – as one would expect. That just doesn’t feel ‘right’ to me and there have been a number of reports of the mummy of Amenirdis I being found since 2001. I live within a mile of that impressive chapel and in early 2003 I spoke to an eminent archaeologist and Egyptologist from the British Museum in Amenirdis’ chapel in Medinet Habu. Apparently the mummy of Amenirdis I has been found, but not in Medinet Habu and the BM archaeologist was unable to tell me where the mummy was found or where it had been moved to. I would like to know that the mummy of this Royal Queen is intact and, hopefully, in good condition but no-one seems to have any answers regarding the whereabouts of Amenirdis I’s remains. Why is that? If a museum has the remains kept in a safe environment then I would be very happy to know that. 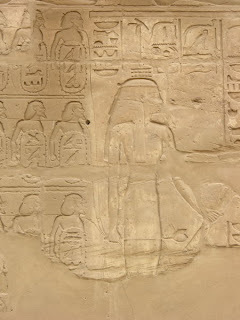 If a private collection has obtained the mummy I would hope that an expert has been consulted to aid in preservation. As much as I would like to pay my respects to Amenirdis I, I don’t think that is likely but just to know that all is, hopefully, well would be wonderful for me personally as I have an incredible interest, as must be obvious from the AI web site and this blog. 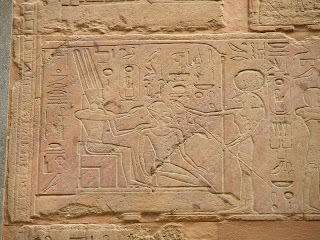 The ‘inner chapel’ or ‘burial chamber’ – supposedly where Amenirdis was interred – a few metres from the glorious black libation table in Medinet Habu had, until 2001, a dirt floor and a rope loosely tied across. 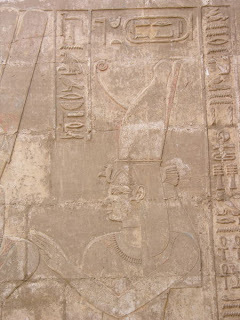 The guards/guides would remove the rope from time-to-time and I have previously sat on the dirt floor contemplating the whereabouts of Amenirdis I’s remains and whether I was in fact sat on top of them! The chapel of the Divine Adoratrice Amenirdis I has changed – the floor is now made of paving slabs, with a concrete-like mix holding them together. Replacing the rope is a basic wooden frame which is occasionally removed by the guards or guides. The change in the floor took place in 2001, I seem to remember. I do not understand why the floor was replaced – not least because public admittance should not be permitted there. Was the floor of the ‘burial chamber’ excavated since the 1990s? What was found? I would dearly love to know. The rest of this small – but incredibly impressive chapel – is in need of further restoration and preservation and it has received considerable attention (to my knowledge) since the late 1990s – the roof is now held in place with metal girders and efforts are obviously being made to keep the chapel standing, thankfully. That again leaves me with a question – why replace the floor where the public are not really permitted? The floor around the outer chapel walls is very uneven and hasn’t even been cleaned, let alone replaced – sand is building up against the edges of the wall reliefs in some places and yet the ‘inner chapel’ or ‘burial chamber’ is as new as it could be. Strange. 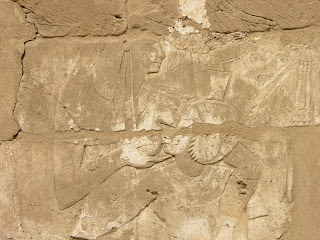 I have plagued archaeologists and Egyptologists regarding the whereabouts of the remains of Amenirdis and I really would like to know that her remains are in good hands and ‘safe’. I don’t want – or need – to know who has ownership or possession but I would be very grateful to anyone who can tell me if the mummy is intact and in safe hands please. Please feel free to e-mail me with any information and if it must remain confidential then so be it. As far as Egyptologists are concerned, the dates of any ruler in ancient Egypt are fairly solid – until the next scholar tells the world otherwise. Some dates/years can be firmly fixed to a specific (and relatively accurate) time period but there is always doubt. That is the way of history in ancient Egypt and we have to accept that some dates are not to be relied upon – they are often best viewed as a guide only, in my opinion. Regnal years, in some cases, are ‘fixed’ by an event that can be proved – solar eclipses being a good example. There is always doubt about any date or year stated by scholars and Egyptologists and we must live with that fact. 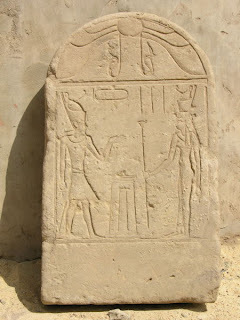 Shabaka’s reign was initially dated from 716 BC to 702 BCE by Kenneth Kitchen. 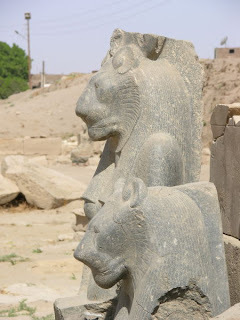 However, new evidence indicates that Shabaka died around 707 or 706 BCE because Sargon II (722-705 BC) of Assyria states in an official inscription at Tang-i Var (in Northwest Iran) – which is datable to 706 BCE – that it was Shebitku, Shabaka’s successor, who extradited Iamanni of Ashdod to him as king of Egypt. 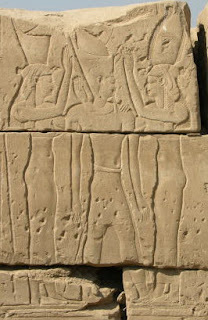 This view has been accepted by many Egyptologists today such as Aidan Dodson, Rolf Krauss, David Aston, and Karl Jansen-Winkeln among others because there is no concrete evidence for co-regencies or internal political/regional divisions in the Nubian kingdom during the Twenty-fifth Dynasty. Amenirdis ruled during the Third Intermediate Period, XXV Dynasty – 736-690 BCE though some sources state her dates as being 740-720 BCE. There is still doubt regarding the dates that Amenirdis I lived and ruled. 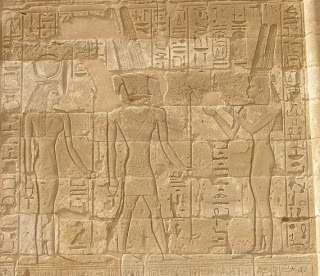 However, there are references to Amenirdis I ruling as ‘God’s Wife of Amun’ and ‘Divine Adoratrice’ for approximately forty years.